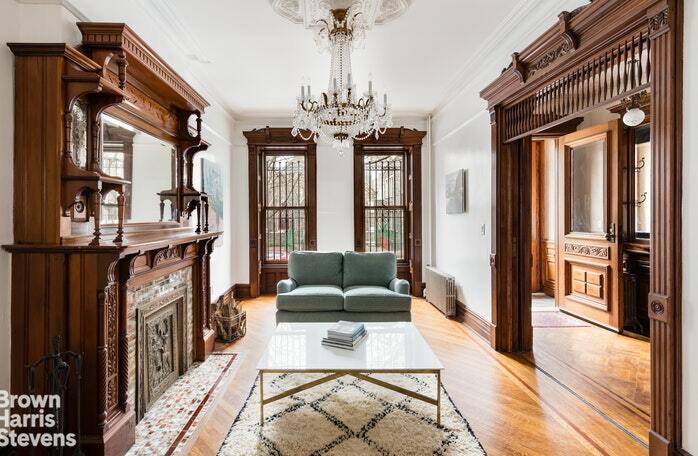 Nestled in the Landmark Stuyvesant Heights Historic District, 164 Macdonough was constructed in the early 1890's by John Fraser in collaboration with notable architect firm Amzi Hill & Son, emulating an interesting Romanesque Revival style. 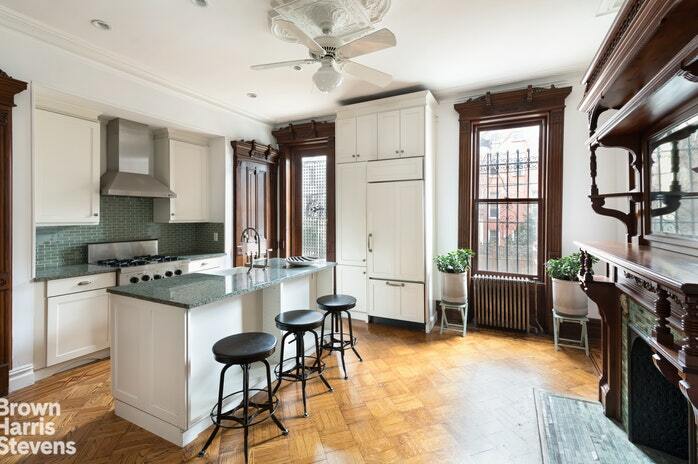 This impeccably preserved two-family townhouse is a stunning jewel box that is also move-in ready! 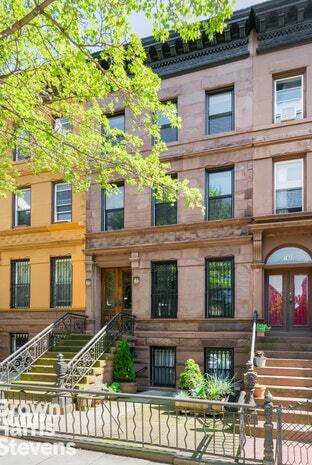 It is ideally laid out as a four bedroom two and half bath triplex over one bedroom one bath garden rental. Updated kitchens and bathrooms with top-tier appliances and classically beautiful, well appointed bathrooms make this a home not to miss out on. 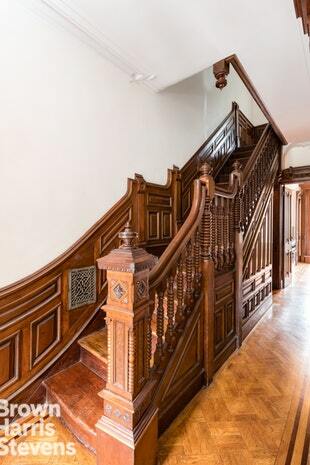 Enter the parlor floor up the stoop to an original double door foyer and entry hallway with an incredibly grand and unique staircase with stunning mahogany spindles, treads and banister. There is a double parlor layout with two massive original fireplace mantles, including one that is wood burning in the main living room. The chef's style kitchen in the back with a large central island includes custom storage and a door to a deck with stairs to the garden. There is a Thermador range, Bosch dishwasher and Subzero fridge. 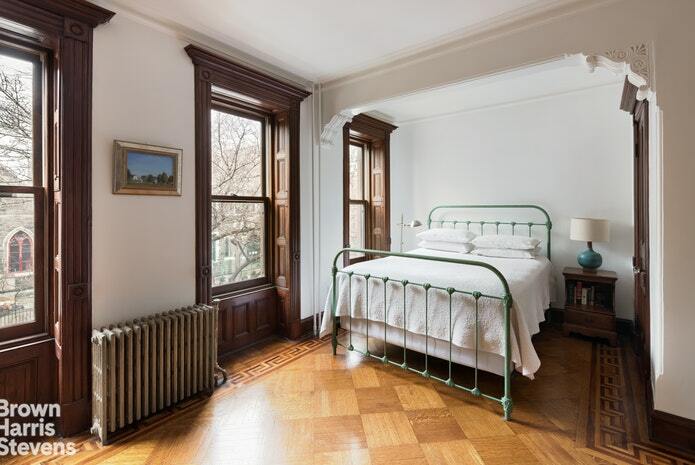 High quality Marvin window casings, long plank parquet floors, working pocket shutters and pocket doors round out the impressively maintained details of this historic home. 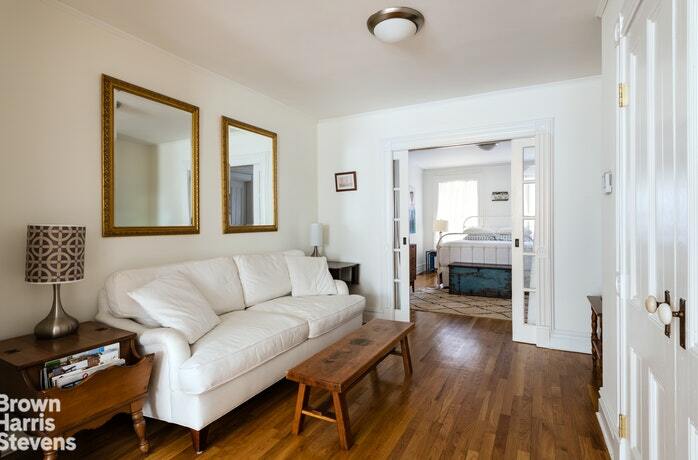 The second floor has two large bedrooms that could easily be used as a master suite. The front bedroom has a wood burning fireplace, working shutters, and beautifully unique ceiling and corner plaster work. 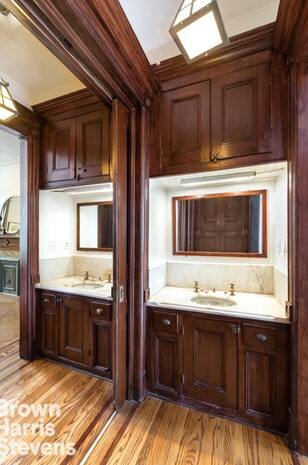 Two marble countered porcelain sink built-in vanities divide the two bedrooms in classic fashion. Beautiful dark wood cabinetry, a second decorative carved mantle, and extra large closets are built into each room. 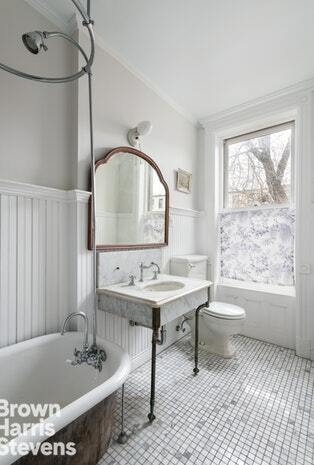 The master bath has marble tile, a claw foot tub and shower, and a chrome and porcelain sink. The room also features massive south facing window looking to the gardens below. 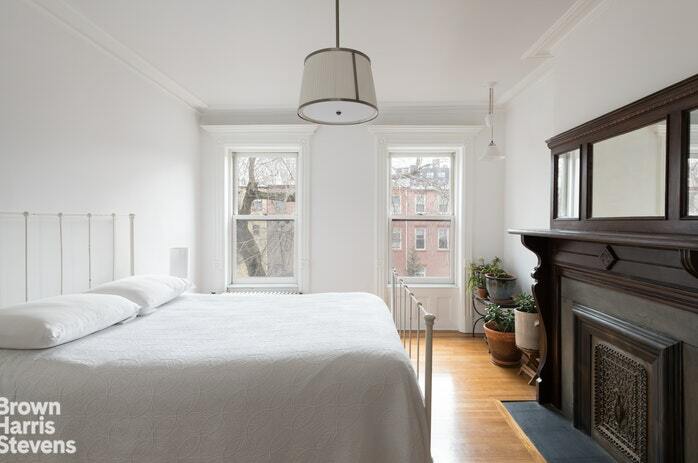 The top floor has another two large bedrooms and a skylit central study or den. The extra large bathroom has a walk-in shower and well appointed finishes. 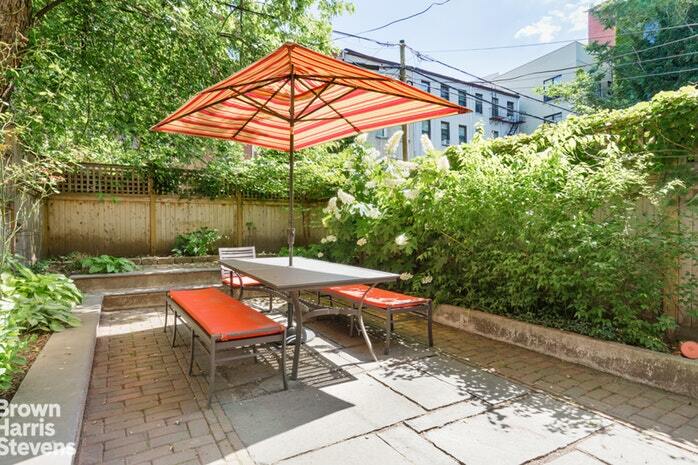 There is a half bathroom accessible to the owner's triplex on the garden level and private basement access for laundry, mechanicals and storage. 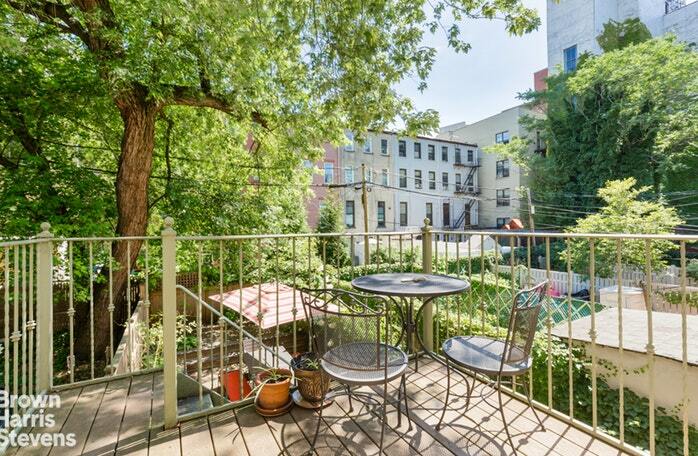 The extra large one bedroom garden rental with a small extension for the kitchen provides for excellent income potential. 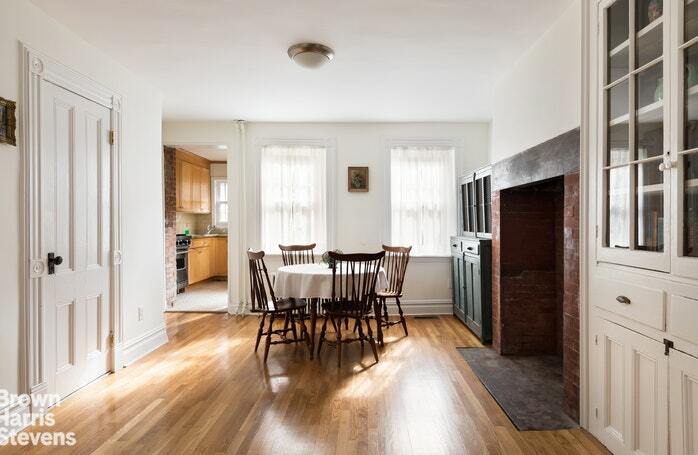 There is an impressive floor to ceiling brick hearth in the dining area, glass paned French doors dividing the rooms, and an egress to the garden in the rear kitchen. Central air conditioning services this floor, along with a Viking range and stainless steel appliances. The unique brownstone facade faces one of the grandest churches in all of Stuyvesant Heights - Our Lady of Victory Church, on a perfectly continuous landmarked brownstone block. 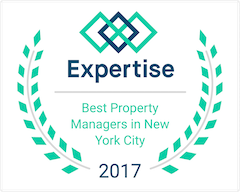 Conveniently close to the A and C subway stations as well as many of Bedford-Stuyvesant's most reputable hot spots: Saranghina, Lunatico, Peaches Hot House, L'antagoniste & Bed Vyne Brew among many others! 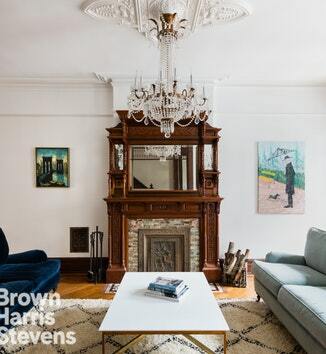 This house is not to be missed and a unique offering for the most discerning buyer looking for modern amenities discreetly integrated into a beautiful turn of the century home.